Make no mistake, the Bellwether is a monster. 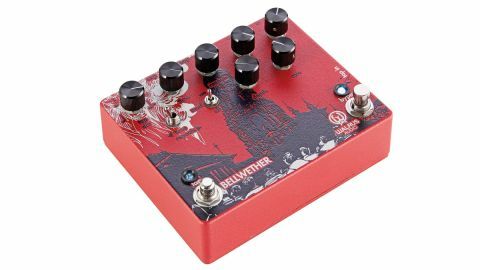 An analogue delay with a level of on-the-fly controllability we'd only expect from a digital machine, the Bellwether is a mind-blowing piece of work. The tap tempo gets things off to a start matching the delay to the speed of your playing. What's great is that you can quickly chop your repeats into quarter notes, eighth notes, dotted eighth notes and triplets. We also like the vintage degradation of each success repeat, a warm by-product of analogue 'bucket brigade' technology and how tweaking the rate and depth controls adds some 'wow and flutter' for a pretty convincing 60s tape delay effect. That oldcliché that 'we're just scratching the surface' was coined for the likes of the Bellwether.